In the past few weeks, a conflict which has been brewing for decades erupted between Israel and the West. It does not involve settlements, UN votes, or the Palestinians. It is a crisis between Israeli Jews and Jews in the Diaspora (other nations). Many Jewish people living outside the Land say they have been terribly betrayed by the government of Israel. On June 25, the Netanyahu-led Israeli cabinet made two policy decisions significantly impacting Jews in the nations. The first was to suspend a compromise agreement on public worship at the Western Wall that took four years to negotiate. Currently, all public worship and prayer at the Western Wall is controlled by a handful of ultra-Orthodox rabbis. The new agreement would have authorized public and audible prayers at the Wall by Reform, Conservative and less restrictive groups of Orthodox Jews. Women would also have gained new freedom. In choosing not to implement this agreement, the government limited public prayer at the Wall strictly to ultra-Orthodox Jewish men. The second decision concerned a bill that recognizes only Orthodox (as defined by Israel’s Chief Rabbinate) conversions to Judaism. Most Jews living outside of Israel are not Orthodox, let alone ultra-Orthodox. Due to their collective outcry, implementation of the conversion bill was delayed for six months. Diaspora Jews, especially those in America, are largely indignant at the behavior of Netanyahu’s administration, which has in effect declared them to be either not Jewish or not sufficiently Jewish for the State of Israel. Messianic Jews have lived with the vexing situation for decades. Sadly, we are no longer alone. Netanyahu had previously assured Jews outside the Land they would be allowed to publicly pray at the Western Wall. He affirmed to them the Wall is not just an Israeli site, but a holy site for Jews everywhere. After protracted and difficult negotiations, a compromise was reached to which the ultra-Orthodox and all other parties agreed. But as the effective date of the deal approached, some ultra-Orthodox Jews changed their minds. Thirteen members of the Knesset (Israeli Parliament) from two ultra-Orthodox parties, representing just slightly over ten percent of that legislative body, were able to wield such influence over the Prime Minister that, had he refused their demands, his coalition would have likely collapsed. New elections would have taken place, forcing Netanyahu to run for office all over again. To make matters worse, two weeks after the cabinet’s decision, the Israeli Rabbinate issued a blacklist of 160 rabbis, including several prominent American Orthodox rabbis, whom they determined could no longer to be trusted to confirm the Jewishness of people trying to make aliyah (immigrate to Israel under the Law of Return). The list had very little to do with Messianic Jews; technically, we are already prohibited from making aliyah. Most Messianic Jewish Israelis would be happy to see ultra-Orthodox control broken over religious issues in the country, including the Western Wall. Were that to happen, religious strongholds that prevent our people from faith in Yeshua could loosen. More Messianic Jews could make aliyah. The present crisis could possibly provide just such an opportunity for change. Some Jews and Christians perceive 2017-18 to be a year of Jubilee for Israel, based on the 50th anniversary of the reunification of Jerusalem, and more. Please pray with us for a Holy Spirit, Jubilee-type breakthrough in this darkly entrenched, religious stronghold of ultra-Orthodox Judaism. “Consecrate the fiftieth year, and proclaim liberty throughout the land to all its inhabitants. It shall be a jubilee for you.” (Leviticus 25:10) “Woe to you … [who] … shut the door of the kingdom of heaven in people’s faces. You yourselves do not enter in, nor will you let those are trying to.” (Matthew 23:13) “Where the Spirit of the Lord is, there is freedom.” (2 Corinthians 3:17) May Yeshua be worshiped freely on Mount Zion and across the Land! 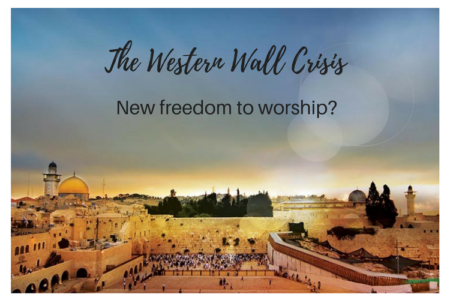 Your ticket for the: Jewish Crisis over the Western Wall: Time for Freedom of Worship?